One day, King Nebuchadnezzar ordered his highest official, Ashpenaz to choose men who are healthy, handsome, smart, wise and educated from the royal families of Judah to become his officials. 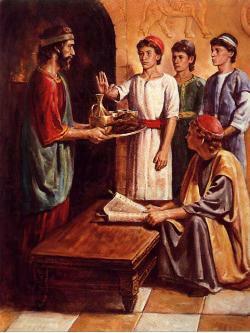 Four young men were chosen. They are Daniel, Hananiah, Mishael, and Azariah. But Ashpenaz gave them different names: Daniel changed name to Belteshazzar, Hananiah changed name to Shadrach, Mishael changed name to Meshach, and Azariah changed to Abednego. Daniel is a faithful believer of God. He only eats and drinks what God approved. So Daniel asked the permission of the guard in charged of them to let them not to eat the meat and drink the wine that they had prepared for them. Daniel said to the guard, “Let us only have vegetables and water for 10 days. After 10 days, you can compare us to the other young men.” The guard agreed with Daniel. After 10 days, Daniel, Hananiah, Mishael and Azariah were healthier and smarter than the other young men who ate the food and wine from the royal palace. God made Daniel, Hananiah, Mishael and Azariah very smart. They read a lot of books and become very clever. Daniel can also interpret dreams. After 3 years, Asphenaz brought Daniel, Hananiah, Mishael, and Azariah to King Nebuchadnezzar so that they could be interviewed. The king interviewed them and discovered that they are cleverer than anyone. So King Nebuchadnezzar assigned them positions in his palace. Yes, educate yourself about the most important things in the world, the word of God in the Bible. Once you know this, all other learning makes sense.